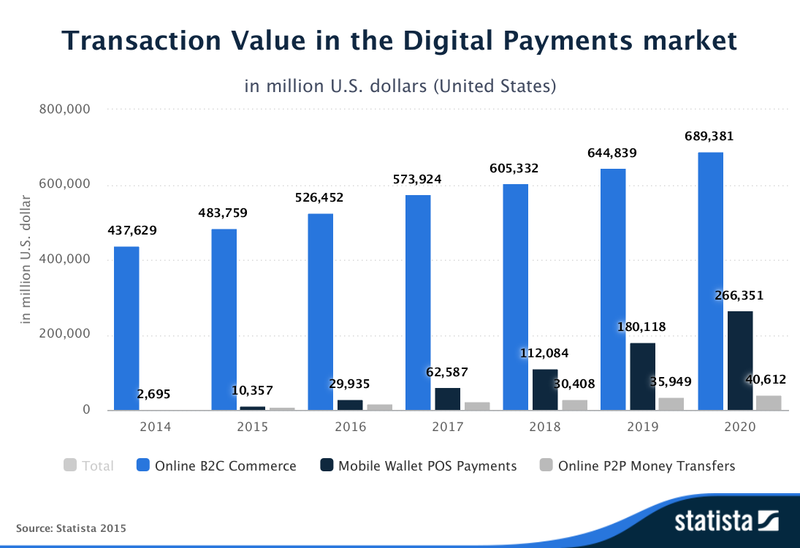 Total Transaction Value in the "Digital Payment" segment amounts to USD 572,867.4 in 2016.The digital payments market's largest segment is the segment "Online B2C Commerce" followed by Mobile Wallet and Online P2p transfers. with a total transaction value of mUSD 526,452.3 in 2016. By 2020 Total Transaction Value is expected to grow by 15% CAGR( 2016-2020) which will resulting in the total amount of mUSD 996,344.6 in 2020. The Facebook store building firm said this figure represents a 17% increase over its Q1 findings.The number of Facebook stores also increased by 26 percent in Q2 from the previous quarter. 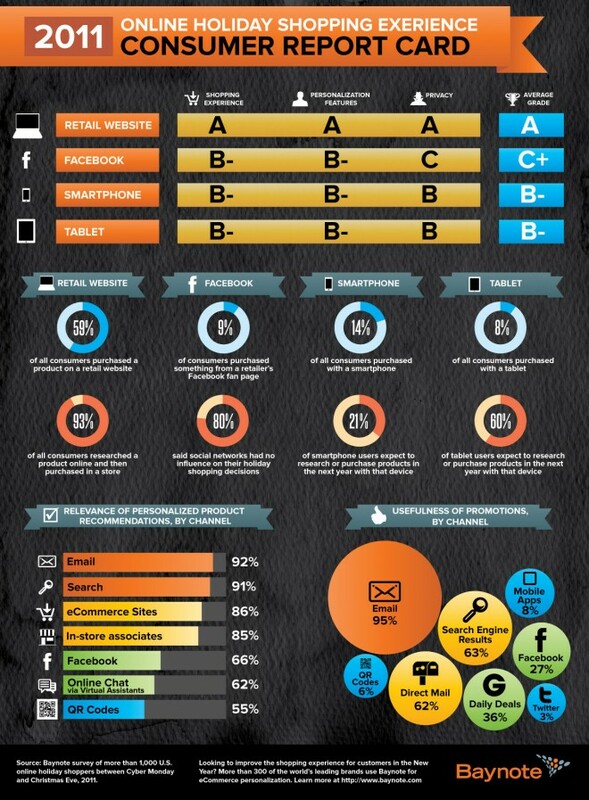 These statistics were pulled from aggregate data based on the 180,000 Ecwid-powered web storefronts in 174 countries, 40,000 of which also have Facebook stores and most of which are small- to medium-sized businesses (SMBs). However not everyone is convinced about Facebook being used as a Ecommerce Platform. Business Insider reports that the first generation of stores inside Facebook have been total flops, Bloomberg reports. Gamestop, JC Penney, Nordstrom, and Gap have all opened and closed stores in Facebook in the last year. Revenue from online daily deal and discounts sites including Groupon and LivingSocial will top $2.67 billion in 2011, up 138% from $1.12 billion in 2010, projects Local Offer Network Inc., which sells advertising and technology services to group-buying sites. The company says at least 320 U.S. sites offer daily deals and US Daily Deals sites in total offered 63,000 deals in 2010. That record will almost certainly be shattered this year, as Local Offer Network estimates that the first quarter of 2011 brought 40,000 daily deal offers to U.S. consumers. “This is driven by new deal brands and an increasing number of sites publishing multiple offers per day,” the report from the company says, adding that the average daily deal site in the United States serves at least 10 markets. The most popular types of online limited-time deals in the United States remain those related to food and drink, which in the fourth quarter of 2010 accounted for 26% of such online discount offers. Beauty, spa and massage offers continue to hold the second spot, with 20% of offers, followed by fitness and nutrition, 7%, and sports and recreation, 5%.Home products and services are making some of the most significant gains, reaching 6% in the fourth quarter from 3% in the third quarter. Offers related to clothing and accessories also are gaining importance, the report says, reaching 4% in the fourth quarter, up from 2% in the second quarter. 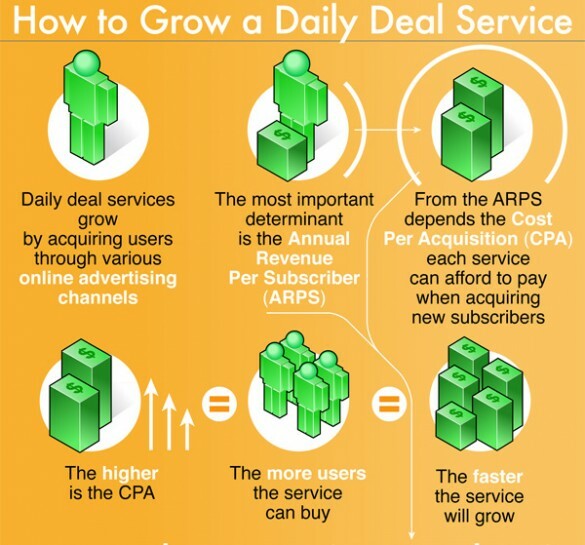 However not all is hunky dory with the Daily Deals Market.A recent study by Rice University found that, on average, just 55.5 percent of merchants made money via a Groupon deal, with salons and spas, plus restaurants, having the hardest time with a Groupon daily deal promotion. In fact, according to the survey, just 43 percent of restaurants earned a profit with a Groupon deal, prompting some to ask why Google even considered buying it in the first place. 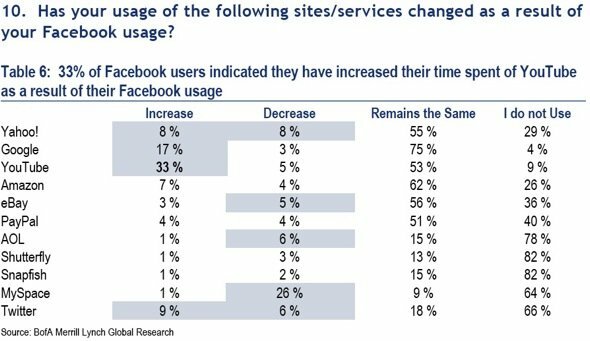 As Facebook grows, one concern for Google is that users could eventually turn away from traditional search and instead ask their friends for advice and answers.So far, that's not happening according to the chart below from Bank Of America Merrill Lynch. 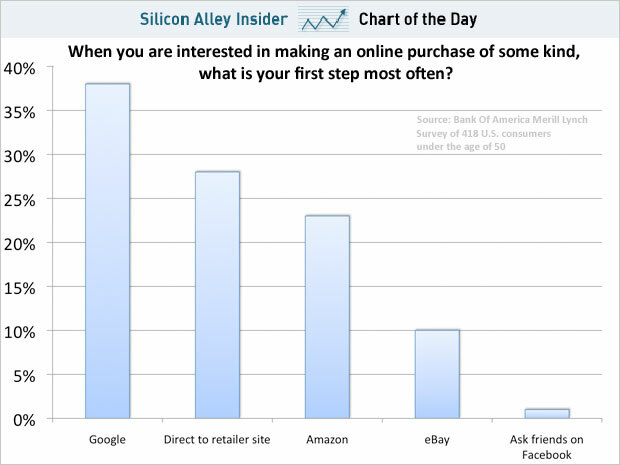 When consumers want to research buying something, Google is still the primary option. Only 1% of 418 people surveyed say they ask friends on Facebook about the product. Of course, the real long term risk to Google is that Facebook has a trove of important data which it can not access. But, for these other concerns the data from Bank of America provides some relief for Google. And for Facebook, this chart isn't bad news, either. It's still a place where users hang out and can be influenced by display advertising.